Home Case Study Clickbooth CPC Program, an Adsense Replacement? Clickbooth CPC Program, an Adsense Replacement? There are many ways to monetize a site. One and this is how I started is adding Google Adsense blocks to your website. 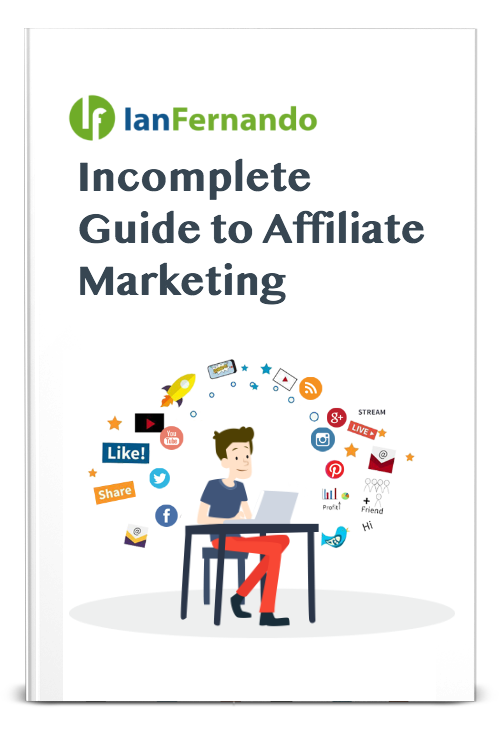 It was one of the first ways I actually started making money online, along with ebay. The problem with Google Adsense it took me several months to get my first $100 check. I would never ever monetize a site with adsense, just because of the complexity it can be. You really need a high volume site to utilize adsense. Well 2 years ago I came out with a platform that does just that, called CPA Shuffle – which I have stop. Now the end of 2010, a new platform rises, Clickbooth CPC. Similar to adsense and my past idea CPA Shuffle, it takes offers puts them in an IAB display style box and displays offers. The difference is you get paid on a per click basis, similar to Google Adsense. So if someone clicks on an offer, they convert you are just paid on a CPC level not lead level. I do not know how they calculate the click earnings but I think it is definitely way more than adsense. Here is my stats with only 2 clicks which earned me $.40! Baaalllin! Anyways, there was a bit of confusion on the reporting. 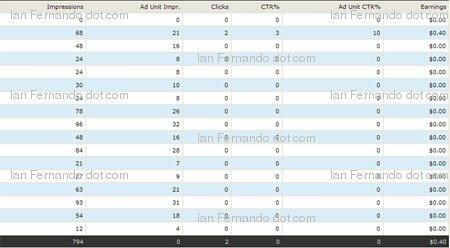 Ad Unit Impressions means each ad (offer) that was within the Ad Unit. So if I have a 300 x 250 ad unit, the Impressions would be (let’s say) 100 and the Ad impression would be 33 – because there are 3 ad displays within the ad unit itself. Interesting numbers. Now I did collab with Clickbooth a bit to better improve their system and give some great ideas on how to better their reporting and even monetize it as a whole. Currently I am rotating this on another blog with banners and even adsense. I want to see if the banners (affiliate offers) or Google Adsense itself will pay better than Clickbooths CPC platform. I am simply just rotating the code, with OIO Publisher. So the way that the CPC system works is advertisers pay to be within these ad blocks, no offers are being pulled from the network ad being displayed on the CPC Platform. When I created CPA Shuffle, I pulled offers from the network and displayed them on ad blocks. My thinking was I can always get new/updated offers and display them in specific niches and get a higher payouts if they convert. I am even thinking about re-opening CPA Shuffle because my technology is already surpassed Clickbooth’s CPC Platform. I think anyways. Plus it was a 2 years ago that I came up with this idea. The industry is just catching on. The only difference is Clickbooth CPC platform displays images and text, similar to a facebook ad. While CPA Shuffle just did traditional adsense style format, text. 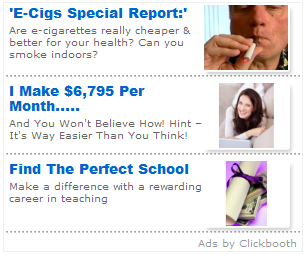 Here is an example of an ad in the health category on a health blog I have. So you can see it only has 1 ad related to health. The other 2 can be categorized elsewhere. This is the other problem I have with the ad platform, no relation to the niche or category I chose. The reason is because advertisers optionally put themselves into the CPC platform. Offers are not pulled from the network. So it fills empty space with other advertisers. Now, what would have been awesome, since they are tracking each offer unit, the ability to see what offer received the click. This way if I have this ad on my health blog and the EDU offer is getting the most click I can change my ad unit category to education on a health blog. Better monetizing the site. But they are working on the platform still as this is still in beta. So more advertisers will be added and hopefully have a more targeted offers for the sites or niches everyone have. It seems only the popular diet, health, edus are populating within these ad units. The reporting definitely can be more user friendly and the creation of units as well. I actually didn’t like the way ads were created, so I took the time to decipher the JS code bit. It works the same way the old adsense style box worked. By simply reorganizing the JS commands a bit you can pull any category and adjust the ad unit size. But then it does throw your tracking and reporting off for traffic sites a bit, then again the ad unit captures the referring site. So the reporting should be able to see this in the reporting somewhere, but isn’t – I know they are capturing it because the referring site is being passed through on a per click basis. You create ad units by traffic source, so this way you can easily track which site is producing the most clicks. Since it was a bit of a hassle, I just dissected the JS a bit to make it easier for me. 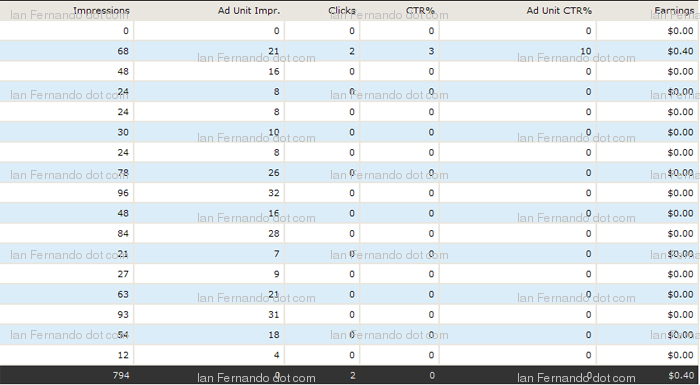 Reporting is the most important part, the more data I have the better I can optimize these ad units. I am still playing with these ad units, rotating it with banners and adsense. So I will give an update on what I find. Maybe restart CPA Shuffle?